Halloween Fun Font KAE	#89728 22"
Halloween Witch Haunting KAE	#51999 22"
Deco Bubble – Spider’s Web KAE #17392 24"
Give Thanks Acorns & Leaves KAE	#52000 22"
Ghosties, Goblins, and Ghouls gather… have a haunted Halloween with Qualatex®! Use this 2-Sided Eyeball (see page 5) as inspiration next time you’re recreating your favorite creepy creature! 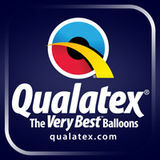 Due to their unique production, Qualatex SuperAgate® balloons vary in color and marbling. Visit qualatex.com and search“Inspiration” for wicked cool Halloween decor like this cute little spider! Leaves are falling, autumn is calling…visit qualatex.com and click on “Inspiration” for more seasonal bouquet and decor ideas! Merry & Bright Lights KAE	#89736 22"
Deco Bubble – Wrapped Presents KAE	#52004 24"
Deco Bubble – Big Polka Dots All Around KAK	#16872 20"
Deco Bubble – Gold Confetti Dots KAP	#89727 24"
Deco Bubble – Colorful Confetti Dots KAP	#57791 24"
Bubbly Wine Bottle & Glass KAG	#68810 24"
Deco Bubble – Egg Blue Frosty Snowflakes KAE	#52005 24"
with these exquisite air-filled balloon structures that will last throughout the season. Say Cheers to the New Year! Make a resolution to create more balloon decor this year with Qualatex®. Our Bubbly Wine Bottles are easily customizable with a New Year’s message. Add more sparkle and dimension to New Year’s designs by double stuffing our new gold confetti Deco Bubble. 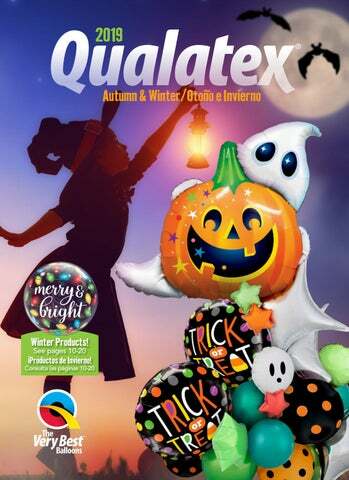 See the 2019 Everyday Catalog from Qualatex® for the complete line of solid-color Microfoil® balloons! Add some sparkle and shine to balloon bouquets with new Glittergraphic balloons! Qualatex SuprafoilTM balloons offer superior float times and will float for up to 30 days! Lightweight Suprafoils offer more lift, even in higher altitudes. They also retain helium so well that you’ll spend less time and money freshening your stock. Order early from your Qualatex® distributor! For the name of a distributor, visit “Find A Distributor” on qualatex.com, or call 1-800-999-5644. UK 0800-28-12-15 Europe +44-1279-501090 Canada 1-800-263-6861 Mexico 01-800-590-4602 Australia 1800-814-634 Brazil 55-11-3109-1400 Other countries 316-685-2266 International offerings may vary. Licensed balloons may not be available in all countries.